I always cringe whenever I see someone select an entire line of code in the Visual Studio code editor before copying the line or deleting the line (see Figure 1). You don’t need to do this. 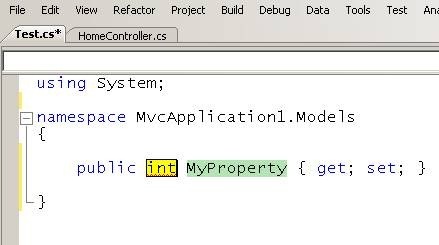 If you want to copy a line of code then you can simply press CTRL-c to copy the line and press CTRL-v to paste the line. If you want to delete a line, don’t select it first, just press CTRL-x. You’ll be surprised how much time this one tip will save you. 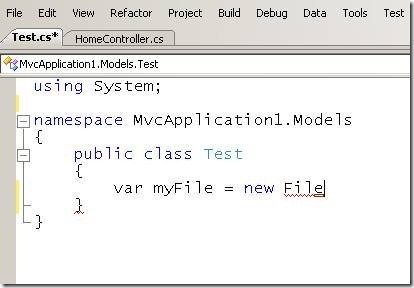 In the old days, before Visual Studio 2008, if you used a class in your code that was not a member of any of the existing namespaces imported in your code then you had no choice but to look up the class in the documentation and enter a using statement to import the new namespace. 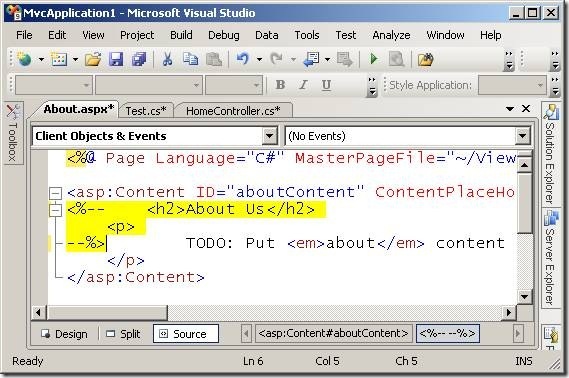 Visual Studio 2008 is smart enough to import namespaces for you automatically. If you type the name of a class that inhabits a namespace that has not been imported then Visual Studio displays a red bar beneath the class in the editor (see Figure 2). You can press CTRL-. to display a dialog box for picking the right namespace to import. Finally, just press the ENTER key to select a namespace (see Figure 3). Never type property declarations by hand. It takes forever! Instead, just type prop + TAB + TAB. When you type prop + TAB + TAB, you get a code snippet (template) for entering a property. Use TAB to move between the template parameters. 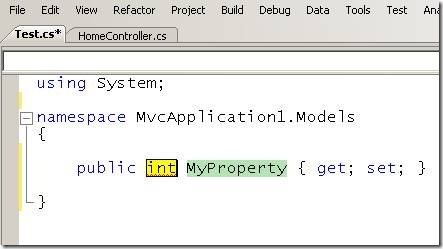 Press the ENTER key when you are finished creating the property (see Figure 4). This tip has saved me from many days of tedious property typing. Whenever I finish creating a class, I always clean up the list of using statements that appear at the top of the class file. I like to remove any unused using statements to reduce the amount of visual clutter in my classes. You can remove using statements that are not required by your code by right-clicking the top of your code file, selecting the menu option Organize Usings, and select Remove and Sort. If you need to temporarily disable a block of code, or a section of an ASP.NET page, then you can comment out the region by pressing CTRL-k+c. I always do this when I want to rewrite an existing section of code, but I am afraid to delete the old code before writing the new code. 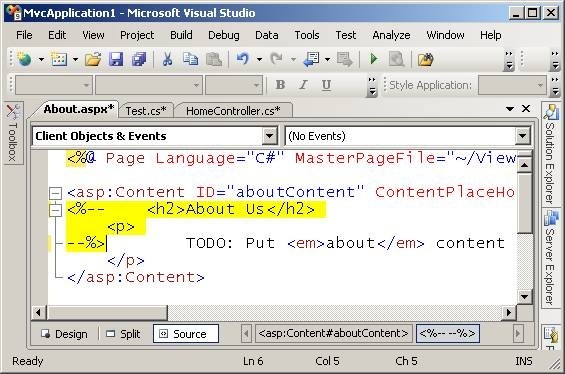 For example, Figure 6 illustrates commented out code in the code editor. You can perform the opposite operation, and uncomment out code, by using the keyboard combination CTRL-k+u. After working in Visual Studio for an extended period of time, I end up with a lot of open documents. I like to quickly switch between open documents by hitting the keyboard combination CTRL-TAB (you can also use CTRL-TAB to shift focus to different tool windows). If you have too many documents open, using CTRL-TAB becomes more difficult because you must hunt through the set of open documents. There are two ways that you can close open documents. You can use the menu option Window, Close All Documents. Better yet, you can right click a tab that corresponds to an open document and select the menu option Close All But This. Selecting this latter option closes all open documents except the document corresponding to the tab (see Figure 8). After you add a user instance of a SQL Express database to a project (a RANU database), you can quickly connect to the database by double-clicking the .mdf file in the App_Data folder. Double-clicking the database opens the Server Explorer/Database Explorer window and expands the objects in the database automatically. I’m always composing new Visual Studio projects from bits and pieces of previous Visual Studio projects. For example, I might need to add a folder from a previous project or a set of files. 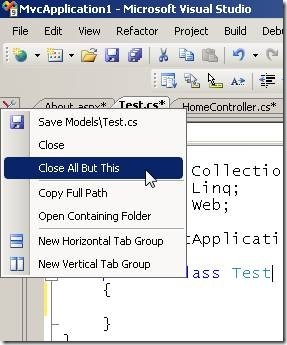 You can add existing files to Visual Studio by right-clicking in the Solution Explorer window and selecting the menu option Add, Existing Item. But, this method of adding files is slow. Furthermore, you can’t add folders using this method. The best method of adding files and folders to Visual Studio project is to just drag the files or folder into the Solution Explorer window (or copy and paste the files or folder). For example, I am constantly adding my MoviesDB.mdf movies SQL Express database to new projects. I keep this file on my desktop and drag it into the App_Data folder whenever I need the database in a new Visual Studio project. This tip is particularly relevant for developers who build applications by using test-driven development. When doing test-driven development, you write a unit test first and then write code that satisfies the unit test. When writing the unit test, you often have to fight with statement auto-completion. There is an easy solution to this problem. Disable automatic statement completion by selecting Tools, Options, Text Editor, All Languages and uncheck the Auto list members checkbox (see Figure 9). After you disable auto list members, you can still display suggestions for statement completion by using the keyboard combination CTRL-SPACE. In general, using the mouse to perform an action in Visual Studio is slower than entering a keyboard combination. The fastest way to add a new item into a Visual Studio project is to hit the keyboard combination CTRL-n or the keyboard combination CTRL-SHIFT+A. The first keyboard combination works in ASP.NET Websites and the second keyboard combination works in both Website and ASP.NET MVC Web Application projects. This keyboard combination opens the Add New Item dialog box (see Figure 10). You can use the TAB and arrow keys to select an item from the dialog box and navigate to the Open button. Press the ENTER key to invoke the Open button. This tip is related to the previous one. After using the TAB key to navigate to the Name textbox in the Add New Item dialog box, you can enter the name of the new item. When typing the name of a new item, you don’t need to include the file extension. 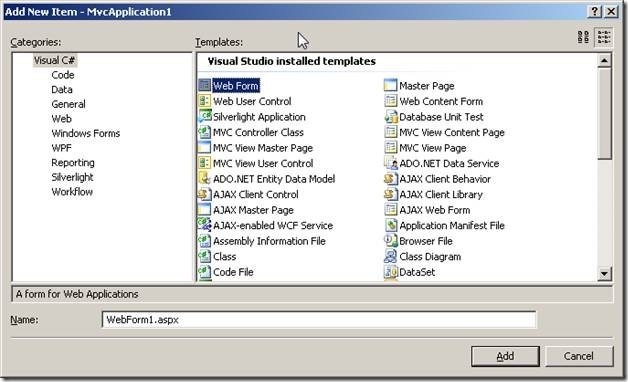 Visual Studio can determine the file extension from the selected template. For example, when adding a new Web Form named MyPage.aspx, you can simply type MyPage. When adding a new Master Page named Site.master, you can simply type Site. You might think that avoiding typing a couple of characters would not matter. But, if you add dozens of files to a Visual Studio project, the number of characters that you can avoid typing quickly adds up. 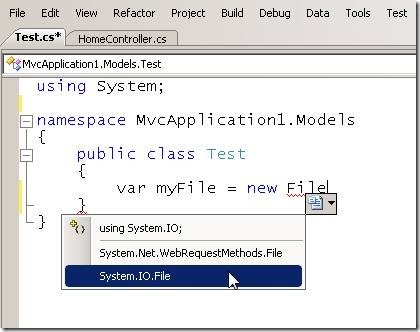 If you have a tip or trick for Visual Studio 2008, please share it in the comments. However, nothing obscure please. I want to focus on only those tips and tricks that matter on a daily basis. great tips. we keep doing what has worked for us all along, and often aren't aware of new or quicker ways to do repetitive actions. thanks. Did not know the one about copy and paste! ctrl-x, if I'm not mistaken, should be a cut. If you want to delete the whole line, I believe shift-delete will do it, and that way you aren't overwriting your clipboard. Maybe I'm wrong, but I don't think so. I totally dig the "prob + tab + tab" one, that's going to be a huge time saver! If you install Resharper, you get a ton of good stuff like this. CTRL-X with nothing selected does cut the current line into the clipboard. If you just want to delete the current line (if, for example, you have something in the clipboard you want to keep), you can use CTRL-SHIFT-L.
One addendum - Ctrl-"." is for more than just adding usings - it works for any SmartTag. Great for Generate Method Stub, Implement Interface, etc. Great Tips, specially first 5 was very new to me and good time saver. Do you know how to let the templates to be listed in the order of the template name? 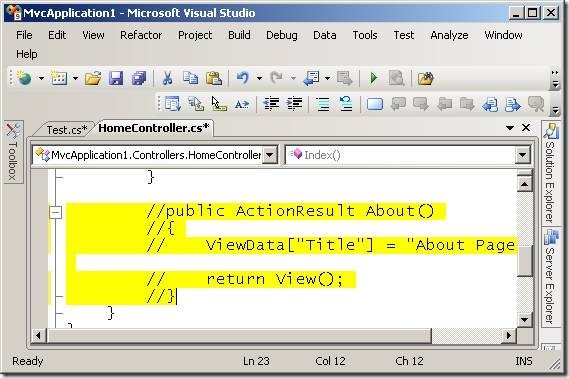 Great tips, and huge time savers, Stephen, I just have a quick query related to Tip#3, we can do the same by right click of mouse on code window and select 'Insert Snippet..' and 'Surround With..' both look to me somewhat similar, so what is the differences why this is created as two different Menus ? Just a question regarding Tip #8. 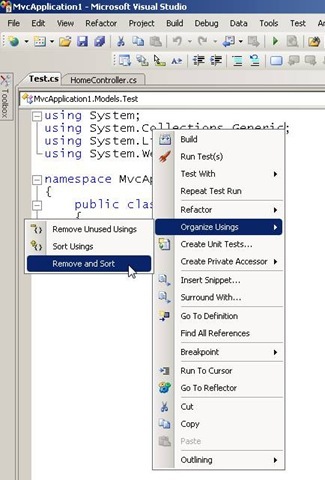 I'm wondering how to enable the drag/drop feature because my VS2008 (Team Suite) won't let me do that. I try to drag/drop files into my apps and it's like a disabled feature, it even shows the blocked mouse cursor (like the no parking sign). Can you help me get to it? Hit Ctrl-k + d to Re-format the code . press Backspace then press Space , this will make it apears again. Tip #2 (CTR-.) doesn't work for me (maybe it does't work on laptops, huh). I use ALT-SHIFT-F10 instead. If you want to encapsulate instance variable into a property you just set the marker on it and press Ctrl + R and hit OK on the dialog. This is really a nice and useful tips. Thanks for the useful tips. Is there any key comibination to Increase/Decrease Indent. This is one feature I have searched for a long time and can come in very handy if available. Anybody ? Thanks a lot. Personally I rewrite the hot key in tips#5 to Ctrl+/,/ to comment section and Ctrl+Shift+/,/ to uncomment it. It feels a lot easier. 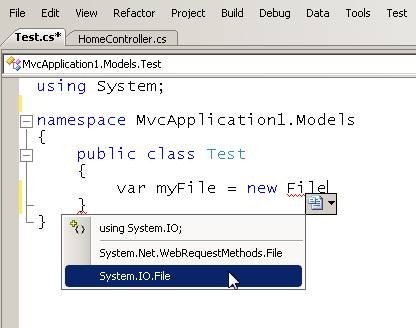 Is this for VS 2008 ? or 2005? The tips are quite basic really, but nice post anyway. Select the text (one or more lines) and press Tab to increase the indenting, and Shift + Tab to decrease it. Of course, if it's just one line you don't need to select it to increase the indenting. I always find it annoying that cntrl-c without anything selected copies the current line, so I switched that off in the settings. (if you did, the first tip doesn't work for you, but that's what you want ;). Shift-del is indeed a welcome helper, though I didn't know about cntrl-shift-L, as I sometimes want to avoid the clipboard destroying of shift-del. The first few i have never seen before - thanks! Ctrl+Shift+V (repeatedly) to cycle through clipboard "ring"
Excellent a lot helpful tips are available. If you want to go to closing curly brace[}] then press crtl + } , which will take directly to the end of the namespace or method. Nice One. Thanks for putting it together. Most of them works for VS 2005 as well - exception is 'Organize Using'. Nice, an easy to follow short list with some very helpful little tips. Thanks! Nice couple of tricks, I try to avoid using the mouse when programming, that's why I knew most of them. (the prop one seems really useful and I didn't knew it). 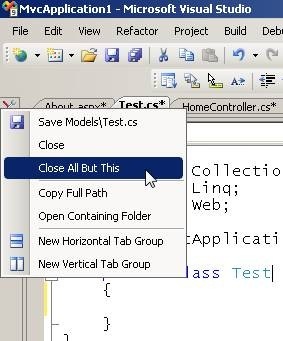 Ctrl+Alt+L Takes the focus to the solution explorer, really useful for opening files that aren't already opened. Ctrl+- To move to the previous position (really useful when navigating through the code with F12/Shift+F12). The "-" must be the one by the 0, not the one in the numeric keyboard. Ctrl+M+M Expand/collapse definitions (for Html tags, methods, classes, regions). Ctrl+F4 To close the current tab (I prefer this to configure the Ctrl+w as Leon sugested, although sometimes I get confused bc Notepad++ uses Ctrl+w to close tabs). Definitely the shortcuts are great, and save a LOT of time, and I really prefer not to configure custom ones to avoid confusion when working @home or at the office. As others have pointed out... Use CTRL+L for cutting current line. The real beautiful part of it is that you dont have to preselect the entire line! Can also be used to delete entire lines, for ex empty lines. The prop tips was also a good one. I remember reading about how to write your own code snippets, but I never got around to actually check it out. Now you reminded me, as well as giving a tip about the already existing prop snippet. Thanks. For those of you discussing Shift+Delete, it *will* overwrite your clipboard. It's just a matter of preference, really. To add a namespace for the class press Ctrl + >. By pressing Ctrl+Tab and then holding the Ctrl key we can borwse all the Active Tool Windows and Active Files. Tip #9: You should use Ctrl-J instead of Ctrl-Space... J recalculates the autocomplete, plus I kept running into issues with space actually inserting space in some places. Ctrl-J will give you intellisense even if you've typed after the . which is nice. Great for when you're just coding away, no need for solution explorer, error window and whatnot. I use Ctrl+M, O a lot - it collapses all methods so that I can get a high level view of the class. Apparently there are several ways to make auto-completion appear. In addition to Ctrl+Space and Ctrl+J, you can use Alt+Right Arrow. FYI Ctrl+Space is sometimes used as a shortcut key to switch input languages, as is the case on my system. I agree, I'm pained watching anyone code without Resharper. This whole post pains me thinking about life before it. I don't work there, just trying to spread the love. My keyboard and my hands are thankful of this awesome post! My team and I have really enjoyed reading this and thought this is very useful for every developer. I'd like to ask for your permission to republish your article in our publications. We're a online tech publishing community aim to serve the information needs of software developers, architects and designers. Many Thanks! Also, planning to attend PDC 2008? Check us out at booth 1201! Hi, does some body knows the visual studio tip that moves a selected block of code from up to down or down to up. It's very easy to do with the mouse. You select the block of code and keep the right mouse button clicked over the block of code selected and then drag the text to where you want. When intellisense is in the way of some code you want to see, hold Ctrl to make it transparent. When lines get very long, swith to full screen with Alt+Shift+Enter. The same for switching back. 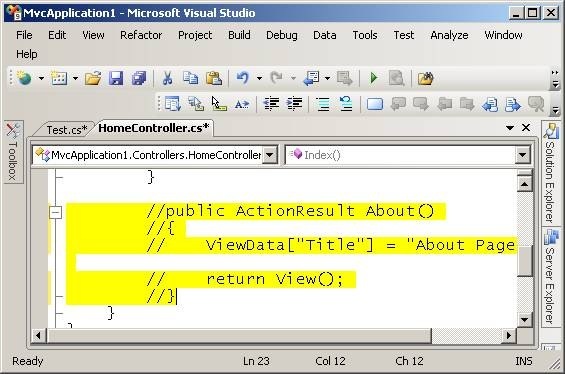 As tip #2 and #4 don't seem to work in VB, does anyone know if there are other ways to get this functionality in VB? You can insert any snippet using key combination CTL - K, X. What worked 4 "prop" also works 4 "try". try "try + TAB + TAB" and u'll get a try-catch block. Here's what i first didn't notice. Once defined the keyword with "CTRL+F3" / "CTRL+SHIFT+F3" u simply can use "F3" / "SHIFT+F3" to search down/up. 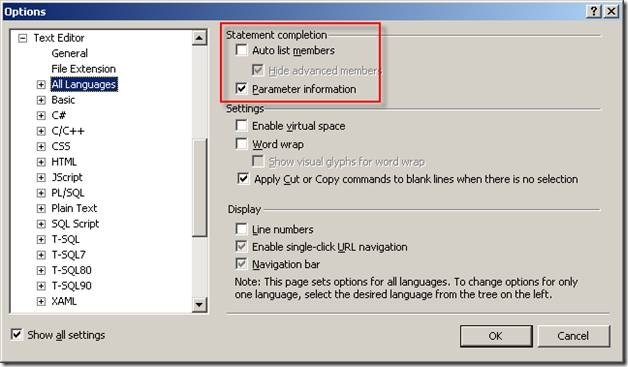 I have all of the checkboxes for statement completion unchecked for both All Languages and for C#. Why do I still get a statement completion dropdown after I type the override keyword and start typing the next word? I really can't stand statemnent completion, please help me turn off this feature. 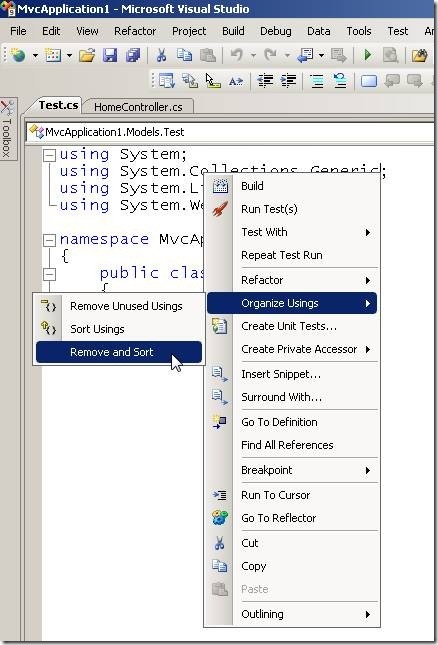 Tip #8 (drag and drop) doesn't work for me if I'm running Visual Studio as Administrator on Vista. However, it works fine if I start Visual Studio normally. Is this a bug or a "security feature" since Explorer is not running as Administrator? I read your book Asp.Net unleashed and was very impressed with the book. I am sure these new tricks will help me in becoming a more efficient coder.